One of the most popular attractions on the Atlantic City boardwalk was "Mr. Peanut." 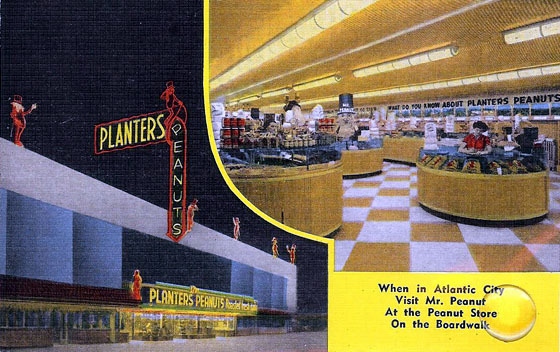 In 1930, the Planters company opened a peanut shop on the Atlantic City boardwalk. There were peanut roasters in the window and the aroma of freshly roasted peanuts spread out the door and all along the boardwalk. Outside there was a man dressed up in a peanut costume, who handed out samples of the roasted peanuts. This was Mr. Peanut. 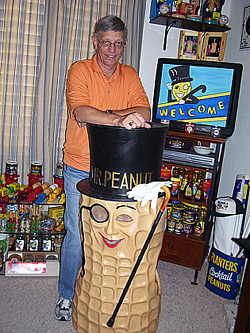 The store and Mr. Peanut flourished in Atlantic City until the shop was closed in the mid-1970s. 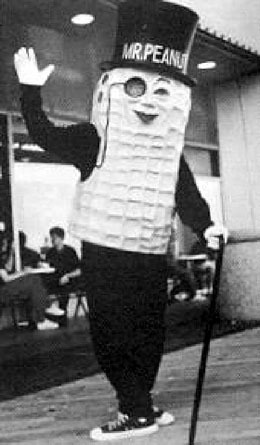 Mr. Peanut was born in 1916 when a schoolboy Antonio Gentile submitted a crude drawing in a national LOGO contest run by the Planters company. A professional illustrator enhanced the youngster's drawing adding the monocle and top hat to create the company logo that became famous. 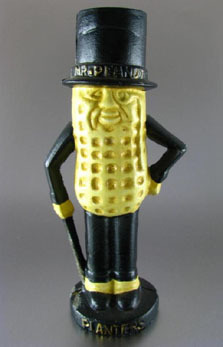 Mr. Peanut is still the advertising logo and mascot of Planters, an American snack-food company and a division of Kraft Foods. Mr. Peanut is a popular collectable. 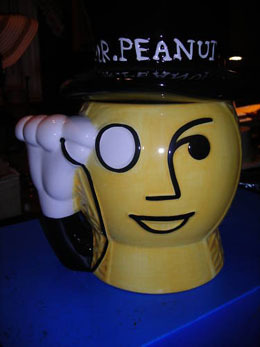 Mr. Peanut items include books, posters, tin signs, cookie jars, pins, baby spoons, salt-and-pepper shakers, silverware, watches, mechanical banks, and even soap. 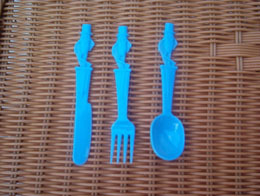 Many of these are commonly found on eBay. A couple of examples are shown below. Some Mr.Peanut collectable items command high prices. 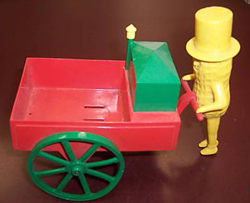 For example, the Mr. Peanut "Planters Peanut Vendor," shown on the right, recently sold at a Pennsylvania auction for almost $500. The Planters Co. was founded by Amedeo Obici, an Italian immigrant who came to America as a child. When he got older, he started started a fruit and nut stand in Wilkes-Barre, PA. He became known as “The Peanut Specialist.” In 1906, he and Mario Peruzzi started the "Planters Nut and Chocolate Co." By 1960 there were almost 200 Planter store locations across the country. 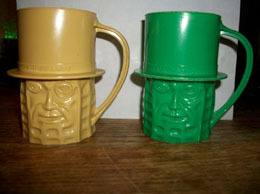 The company was acquired by Standard Brands in 1961. Standard Brands merged with Nabisco Brands in 1981. Nabisco became part of Kraft Foods in 2000.